The requirement to combat the risk of unscheduled plant shutdowns and outages is of course obvious and is a direct result of these being a major cause of unplanned costs to plant operators. The ability to carry out inspection of plant non-intrusively and where possible on line can be an extremely important tool and can be used to achieve this goal. We will therefore review the ultrasonic techniques available and how they can be applied to demonstrate fitness for purpose within planned Plant Management Integrity and Condition Monitoring Systems. Other recent developments such as the move towards condition rather than time based inspection programs also necessitate the development of non-intrusive inspection techniques. All the methods described in this paper can de used Non-Intrusively and in most instances outside of plant shutdowns. It is common knowledge that the majority of industrial plant around the world is subject to licensing by a statutory body or insurance by major underwriters. The norm has been for time limits to be set on the operation of the plant. The operational time limits are established by using data gained from in-service inspection, which would in general be based on a planned maintenance program. Inspection techniques have historically been based on conventional non-destructive testing methods that can be subjective and may be prone to operator error. It is also a fact that most conventional NDT methods have to be applied when the plant is off line during either planned of forced shut downs. The development of non-intrusive inspection techniques has enabled major operators of capital-intensive plant to move from a time based inspection strategy to one that is condition based. Ultrasonic imaging techniques can provide the information needed for plant integrity assessment. 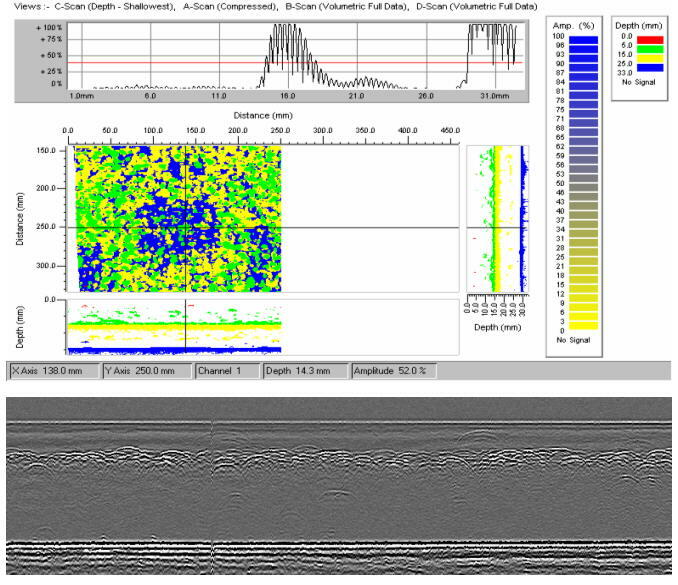 The single most important benefit of ultrasonic imaging techniques is the improvements they offer in controlling coverage and ensuring high quality usable data and the advantage of gathering detailed information of plant integrity prior to planned outages. Over and above this is the fact that these methods can be applied non-intrusively. The equipment and services are available internationally from COOPERHEAT and have been successfully applied in the field for many years. They can range from very simple scanning frames to fully programmable automated scanners, and include sophisticated processor controlled colour graphic display formats with data storage, manipulation and display capabilities. COOPERHEAT have, based on many years experience in the field, selected the latest generation ultrasonic inspection system the Technology Design Pocket Scan. In order to ensure complete coverage of a vessel or pipe several UT techniques may be required. An example of a restriction is the weld cap; this in conjunction with the width of normal incidence transducer precludes colour graphic imaging close to the weld or indeed of the weld itself. The Time of Flight Diffraction (ToFD) technique however enables this area to be reliably assessed. Some geometries of weld do not readily lend themselves to inspection by ToFD. Examples of these are nozzle or penetration welds and these may be inspected and monitored using pulse-echo shear wave ultrasonic techniques. Corrosion surveys on vessels are in many instances being performed by internal visual surveys or by carrying out ultrasonic thickness measurements from the external surface. Internal visual surveys require the vessel to be opened, cleaned and in many cases vessel internals or catalysts have to be removed. This can therefore only be performed during a plant shutdown. Although corrosion is readily detected, it cannot always be quantified. External ultrasonic surveys may provide quantified results but it must be taken into account that point readings taken at regular intervals over the surface of a vessel represent a very small fraction of the total surface area. A written procedure for the examination is prepared after reviewing operational conditions, plant history, nature of product, materials, experiences with similar plant, plant design, consequences of failure, etc. The initial objective is to identify the presence of material degradation. Only in those cases where this is identified do further, more detailed examinations need to be performed. The results of phase 2 are analysed to assess the overall extent and severity of degradation if any. These results are used, to plan further inspection around those areas, which have been demonstrated to be the most significantly affected. This may involve expanding the scope of the original inspection and/or re-inspecting relevant areas using higher resolution and more critical techniques. The benefits of advanced computerised ultrasonic techniques are that the extent of material degradation is more reliably reported and in certain circumstances the cause of the problem may be identified. Areas analysed during phase 3 can be monitored on a periodic basis to accurately measure the rate at which material degradation occurs. Propagation monitoring is performed on line wherever possible. The screening exercise, under most circumstances, is carried out only once during the operating life of the plant. Subsequent material degradation monitoring is then concentrated on areas where specific degradation is detected, which could threaten the continued safe operation of the plant. The information generated can be used to establish plant remaining life and to assess the implications of continued plant operation as well as providing critical information required to operate a condition based inspection strategy. Most industrial plant around the world is licensed or insured with set time limits on the operation of the plant. This is dependent on the original design and conditional on a shutdown inspection program being observed. Due to prevailing worldwide economic conditions there is very often a requirement to extend the life of plant, beyond its original design life. Hard copy colour graphic images and weld 'profiles' of critical vessels and associated pipework in conjunction with a full RLA analysis may be used as the basis for establishing that the plant may be operated for an extended period within safe limits. The RLA analysis and prior inspection results, obtained by visual and conventional NDT inspection surveys are processed, prior to a shutdown to establish which items or parts of items are the most likely to significantly degrade (phase 1). These items are then scanned using a relatively coarse resolution with colour graphic imaging (phase 2) over the parent material. With TOFD being performed on circumferential and longitudinal welds and manual pulse echo on nozzle welds. The resultant data will highlight the most significant areas which are subsequently analysed in detail (phase 3) with evaluation by ToFD, automated PE and high resolution colour graphic imaging and are subsequently monitored (phase 4), the timing for which may be established through a Fitness for Service regime, which could include a critical defect analysis. One of the most important drawbacks of performing inspections during a shutdown is that in the event that serious degradation is detected, which requires immediate intervention, material, procedures and other resources have to be organised immediately and this very often leads to an extension to the shutdown period. Due to the portability of the ultrasonic inspection system a large portion of the inspection may be able to be carried out via access engineering thus negating the requirement for scaffolding and significantly reducing the associate cost. High temperature couplant and probes enable scanning to be performed reliably and continuously at surface temperatures up to 250 degrees centigrade. Probes are available for taking occasional readings at higher temperature, but these are unreliable where prolonged contact with the surface is involved. Where significant degradation is detected during in-service inspection, remedial work can be planned and structured prior to the shutdown. 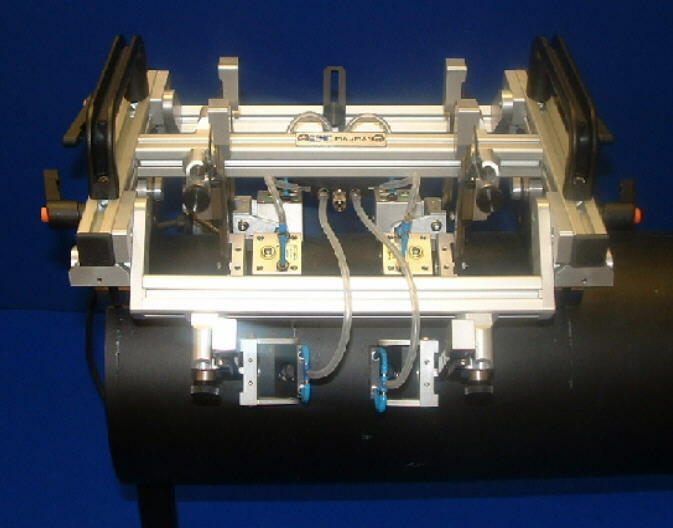 The conventional method of testing welds in pressure systems is the Pulse Echo (PE) technique, which is usually based on the comparison of reflectivity from a known test block. In the late 1970's an alternative ultrasonic technique was developed - ToFD. The ToFD technique involves using a pair of angled, broadband, compression wave probes, set astride a weld facing each other. One probe acts as transmitter and the other as receiver. The beam and amplifier characteristics are selected to produce as wide and even distribution of ultrasonic energy as possible in the through-wall plane. The first signal received is the upper edge of the beam, referred to as the 'lateral wave'. The signal represents the shortest path between the two probes and on a flat surface this represents the material outer or scanned surface. Part of the beam will be reflected from the inner surface, or back wall of the item. This signal arrives later in time than the lateral wave. With prior knowledge of the material velocity and the physical separation between the two probes, the material thickness can be accurately and reliably calculated. In the event that preferential weld or heat affected zone corrosion/erosion is present, a reflection will be obtained from the upper surface of the corrosion profile, which will arrive at the receiver before the back wall reflection. The depth of penetration of this type of degradation can be very accurately measured. The ultrasonic waveform is fully digitised and stored with the data displayed in real-time to create very high-resolution images of weld internal details. All data is collected with the Pocket Scan operating in the ToFD mode and is stored to optical or magnetic disk for future reference. The ToFD technique is also responsive to planar and volumetric buried and surface breaking flaws of all orientations, anywhere in the weld, heat affected zone or adjacent parent material. This means that original manufacturing discontinuities can be monitored for growth during service and service induced flaws such as Stress Corrosion Cracking (SCC), Hydrogen Induced Cracking (HIC), Hot Hydrogen Attack (HHA) and Underclad cracking may be detected and monitored. Manipulation may be performed using dual axis scanners, but the greatest flexibility is obtained using a manually propelled single axis encoded scanner. As all waveforms are saved, the off-line software processing possibilities are numerous. An example of this is the ability to carry out very precise propagation monitoring by creating profiles of defect images. These profiles are superimposed over profiles generated from subsequent inspection data to establish whether any propagation has taken place in the intervening period. As the evidence is hard copy it can be used to justify leaving technically rejectable indications in service, as proof is available that the indications are stable and no propagation has occurred. Nozzles and complex geometries do not readily lend themselves to inspection by ToFD. Although ToFD techniques are now available to carry out these inspections the technique is still embryonic and extremely costly. These may be more effectively inspected using a conventional ultrasonic inspection technique (PE) where reflected signals are evaluated. The inspection can be performed using automated multi axis scanners and sophisticated software however in many instances conventional manual pulse echo ultrasonic testing with correctly skilled operators is adequate. With accurate, thorough and reliable data on plant condition, plant remaining life can be accurately assessed. Ultrasonic imaging techniques provide this type of data and using this plant remaining life can be more confidently predicted. The implications of errors in remaining plant life calculations are that the plant may be unnecessarily prematurely retired in the case of under assessment, or conversely the plant may be operated in an unsafe and unreliable condition in case of over assessment. This has equal importance to plant remaining life and life extension programmes. Plant remaining life can be more accurately assessed. Plant life extension programs may be undertaken with confidence. Safety and reliability are more confidently assured. Plant life may be optimised against production. Repair/replacement programs may be more reliably planned. Information on areas requiring repair is available prior to shutdown. Advanced methods also detect corrosion and other service related problems during their early stages and enable monitoring to be performed during service and Non-Intrusively to predict safe operating periods. In certain instances the cause of the problem may be determined without the necessity of opening the vessel. The improvements in inspection technology, which enables early detection and accurate sizing of material degradation, in conjunction with a refined condition management strategy, can provide the information to avoid unscheduled shutdowns and outages and as such offers major improvements in safety and profitability.